Hello & happy Friday! What a beautiful week it’s been & we’ve been lapping up that sunshine. It’s time for this weeks tour but if you missed last weeks kitchen post, or the week before’s hallway post then nows the time to catch up. This week is focusing on one of my favourite rooms in the house & probably the place I spend the vast majority of my time; the living room. I suppose you could say that this is more of a grown up’s lounge seeing as the kids tend to watch TV & play in the playroom (coming up in a couple of weeks) & so stays relatively tidy. It also means it was designed with that in mind so we didn’t need many storage solutions either. 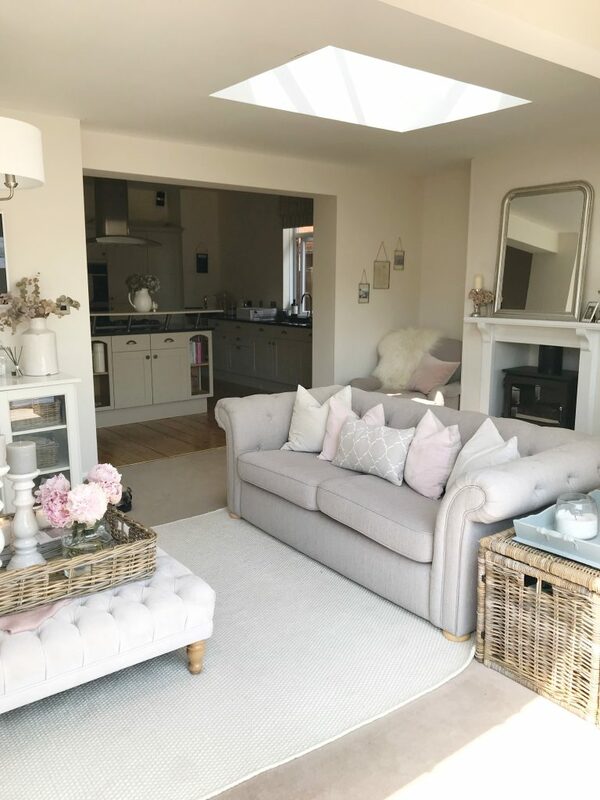 When we bought Baylyn House, this space was actually a conservatory, but after a year or so of leaking & being too hot in the summer/too cold in the Winter (so practically wasted space & unusable – I always advise not to bother with conservatories!) we made the decision to turn it in to a more practical extension. This took 6 weeks & we ended up building up the sides then putting a flat rubberised roof on with two roof lanterns. To save money we kept the original size/footings & reused the glass at the front with the windows & french doors. You can read all about it in the posts here. The space is very long & thin so the layout is fairly limited. That being said, it works well with the sofas away from the walls & a large circle with the open plan kitchen & dining room. Paint colour is Dulux ‘Almond White’ which we have running through the entire open plan living/kitchen/dining rooms. A gorgeous off white which makes it look very bright but also has a warm tone. The sofas were from DFS however they’ve now been discontinued. They were the ‘Ashby’ in colour ‘Oyster’ which is a greige (grey beige mix). I always get comments about how comfortable they are considering chesterfields bad reputation for being very hard, however they are very comfy & I prefer not having back cushions & tall arms to give a bit more support. The pale cream cushions are from Ikea, the blush are Christy & the grey print are Neptune. 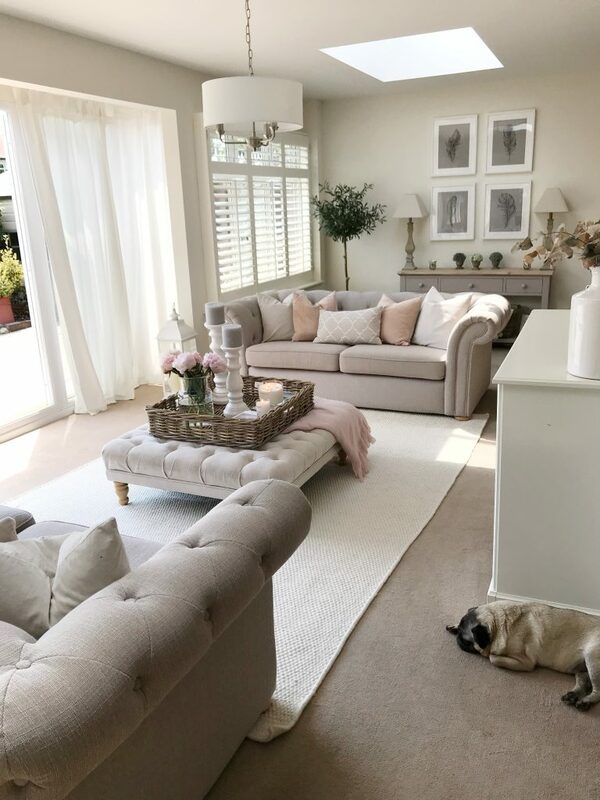 The oversized (1m square) buttoned footstool was from Ebay, however I had quite a few issues when ordering from the seller & know others that have experienced the same so don’t like recommending. You can find similar from Made.com or Loaf though. 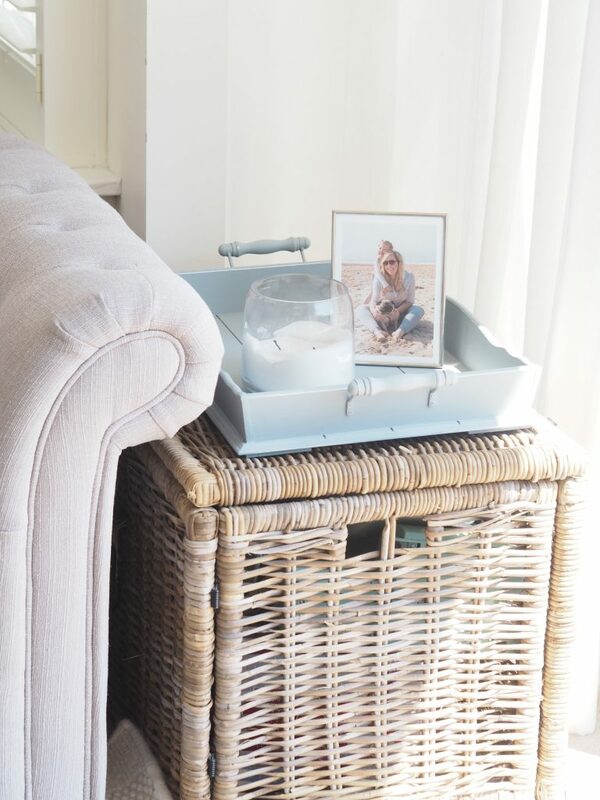 On the footstool is this wicker tray (actually an underbed storage) which you can find here from Neptune which I pop some interior magazines in (because I have an unhealthy obsession! 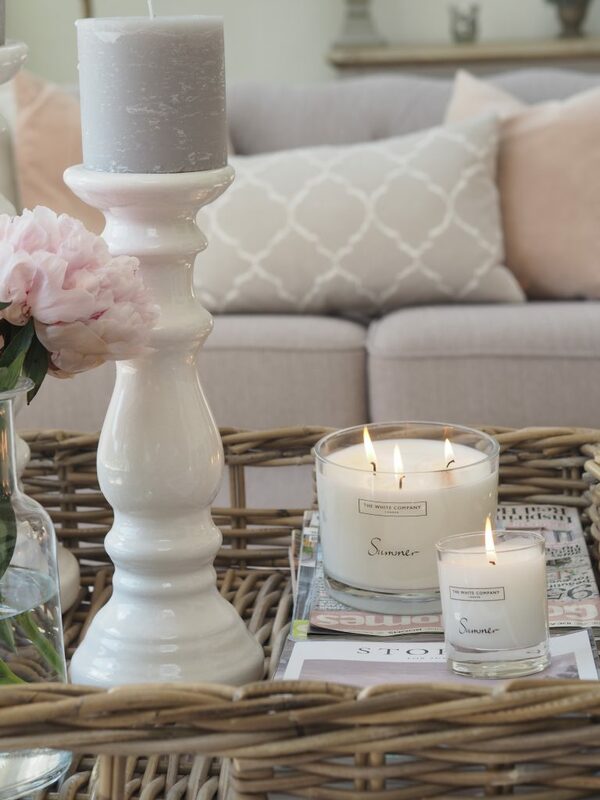 ), my The White Company ‘Summer’ candles (unfortunately sold out! ), some seasonal flowers, in this case beautiful pink Peonies, in this vase (see similar from Amazon) & finally these white candlesticks, again from Neptune. 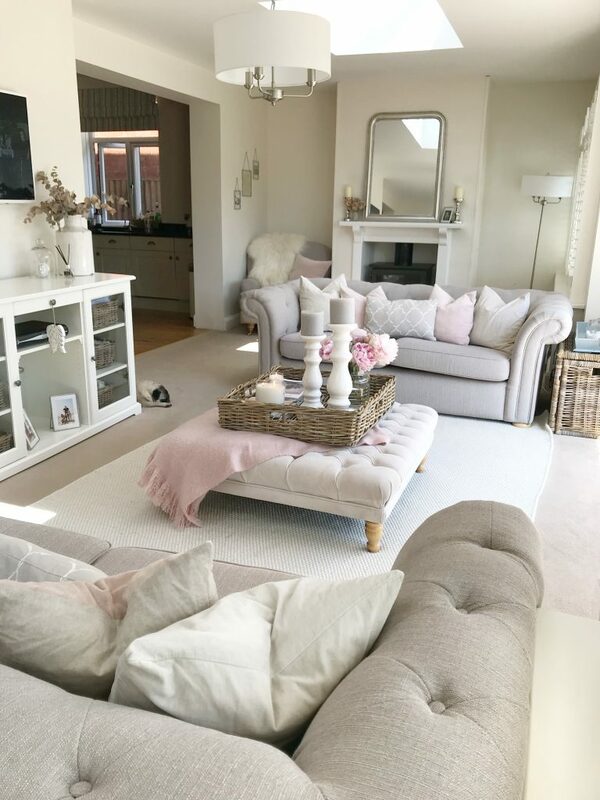 I’ve also popped this beautiful super soft blush pink throw from Laura Ashley under the tray to bring a splash of colour. The rug underneath was a new addition back in March & I love how much it ‘made’ this room. 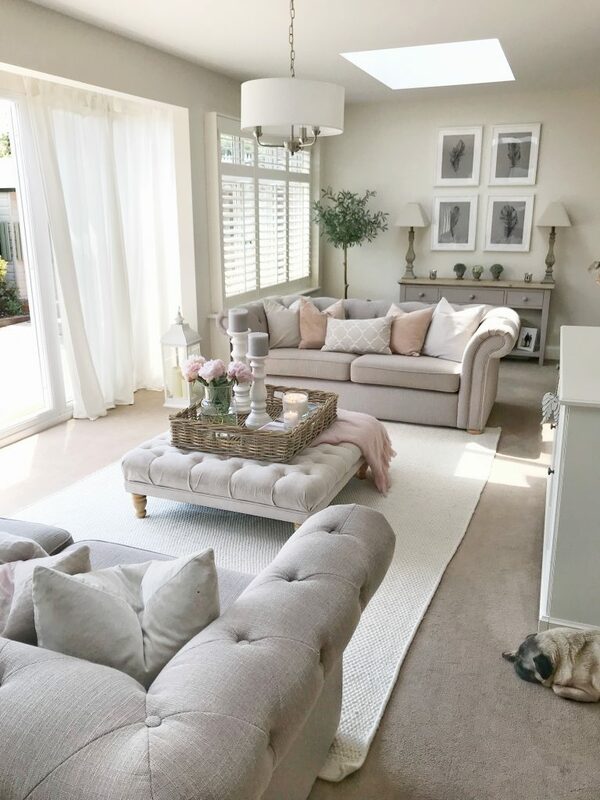 In interior design, one of the ‘rules’ with rugs is that it should be large enough for furniture to overlap & the front legs to sit on to draw the eye & create the illusion of space. This is the ‘Kolong’ from Urbanara & is a whopping 2x3m rug priced at £399.00. The carpet either side of the sofas isn’t the best quality & was quite down-trodden so it’s hidden that too. Above is the most beautiful light fitting, the Grantham 3 arm in satin nickel. I loved it so much I’ve also just put it in my bedroom too! It’s completely sold out on Wayfair at the moment & not due back in until Sept but I’ve found it on Amazon here. 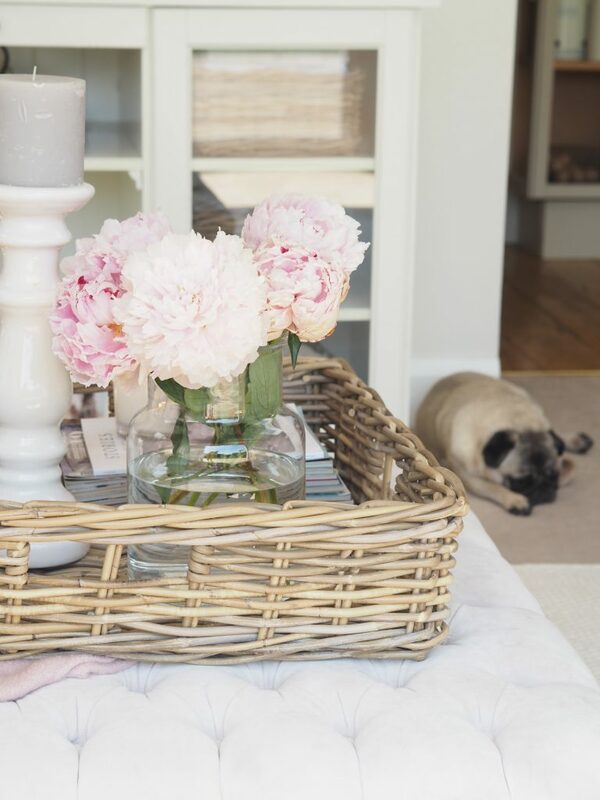 By the left hand sofa is a large wicker trunk which acts as a side table as well as super clever storage. I always say it’s like a Mary Poppins bag as you can fit SO much in there. This was from Ikea but unfortunately they’ve discontinued however you can find similar from Amazon here. 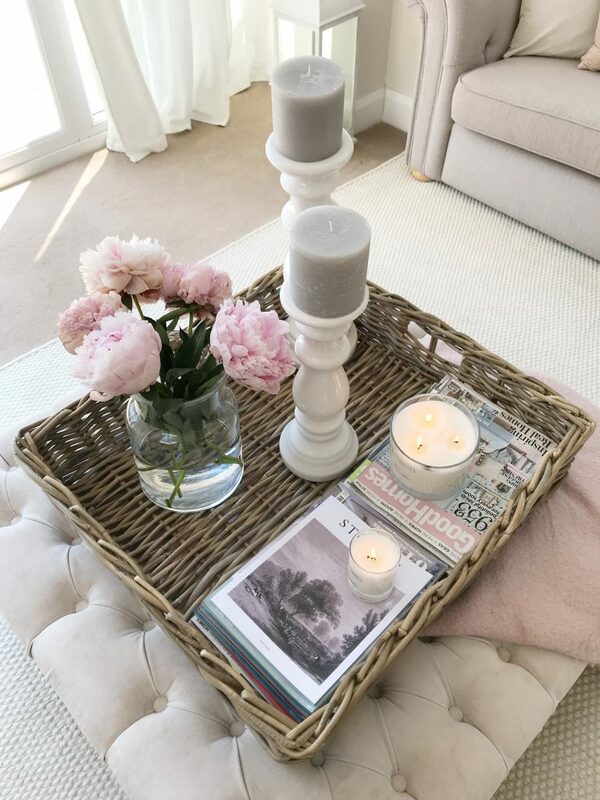 Ive popped a grey tray (this was a tray table from Pretty Little Home a few years ago however is no longer stocked) with a large candle & frame. The curtains are Ikea AINA; we have these in our bedroom & also in Elsa’s room (which I sewed pom pom trim on to…) & are great value for money if you want curtains for decoration only as they definitely aren’t black out. They are a lovely light weight fabric & off white colour which look gorgeous blowing in the breeze with the back doors open. The lantern was from The Range with LED candles, I’m pretty sure this is the same one! Against the partitioning wall is a sideboard which is part of the Liatorp collection from Ikea. This originally acted as our TV stand but we now have a white wall mounted TV which is a Samsung 32 inch available here. On top of the sideboard is a white ceramic vase filled with dried eucalyptus, a Diptyque ‘Roses’ candle in glass dome (Homesense find but you can find similar here) then these beautiful artichoke ornaments from Neptune & another domed candle (I think I have a problem…) this time ‘Pomegranate’ from The White Company. The wicker baskets inside, also from Ikea, house lots of interior design bits like fabric samples, paint charts & wallpaper. 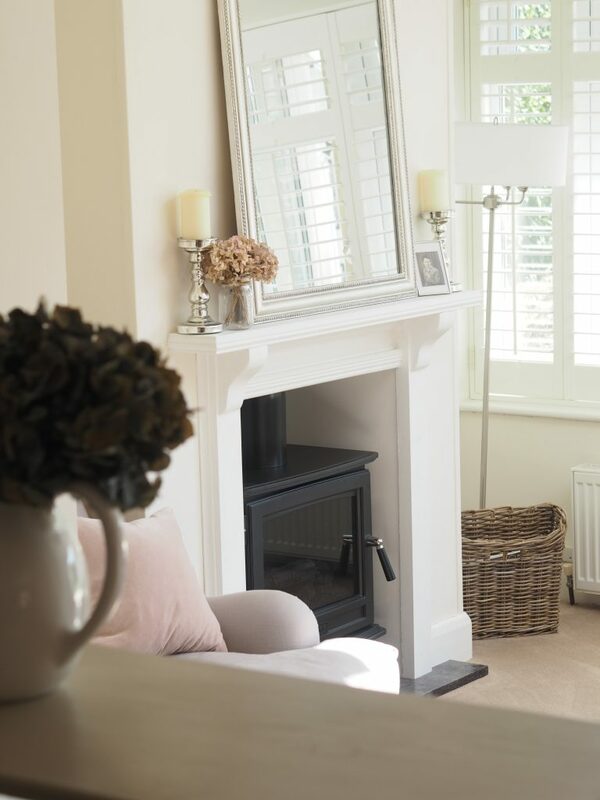 The silver hurricane lantern is from Laura Ashley & you can find the easel frames here. 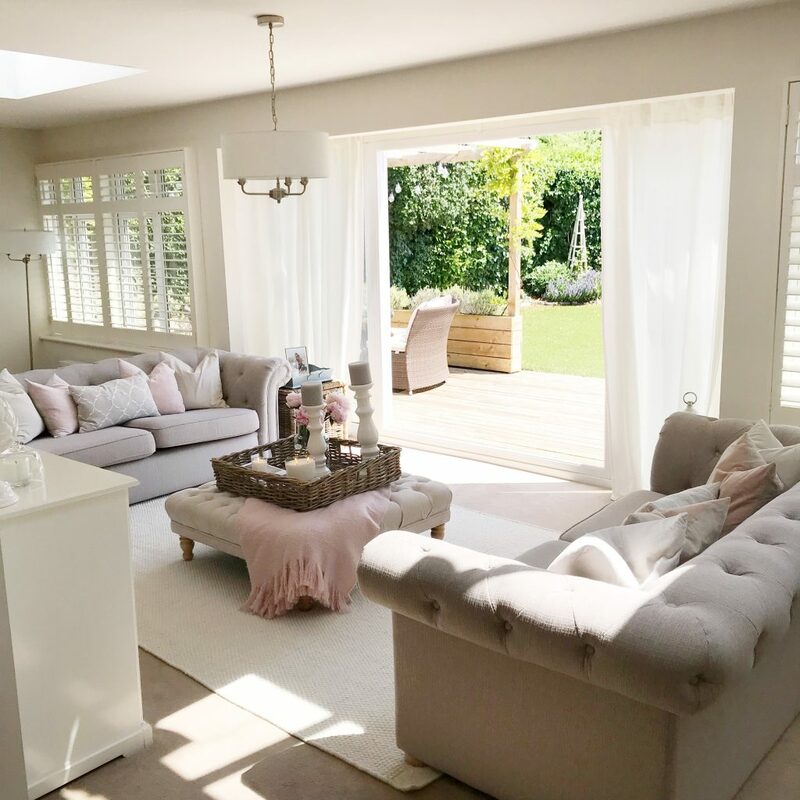 All of the shutters in the house are from California Shutters which are DIY (measure & fit yourself) & I cannot recommend more – not only are they about half the price of many shutter companies but they just look beautiful & give off the most calming light. 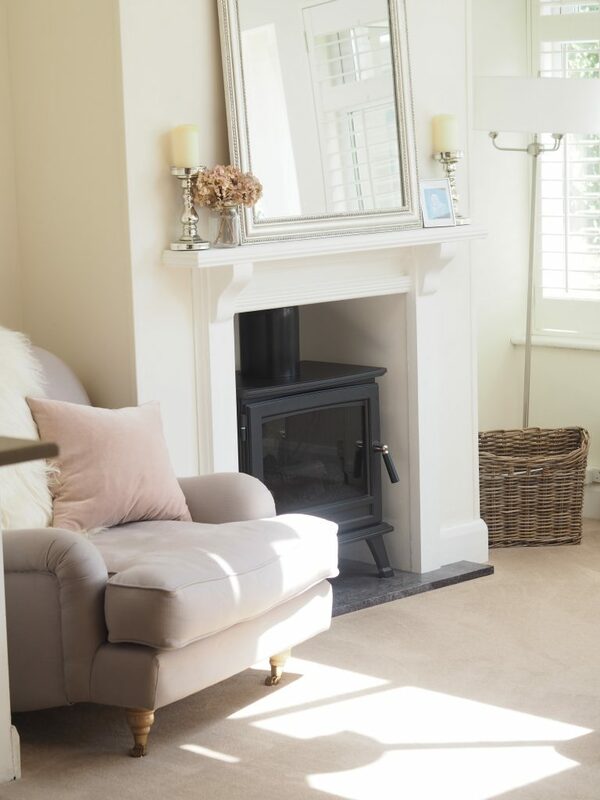 The left side of the living room was given a new lease of life last year when we installed a false chimney breast & log burner effect stove. This added so much character to the new space & although obviously it’s pretty redundant at the moment in the Summer months, it really comes in to it’s own & is so cosy in the Autumn/Winter. You can read about the whole process here. 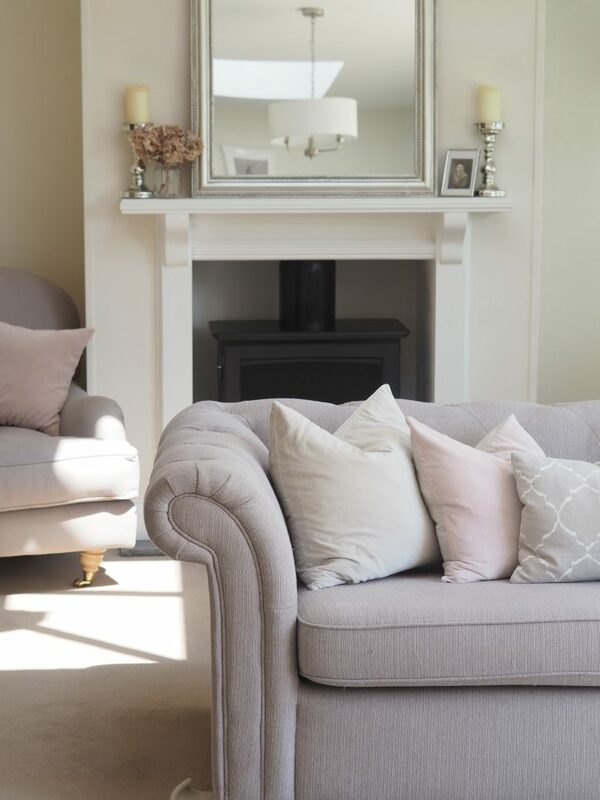 The chair to the left is the Bampton armchair from The Cotswold Co in ‘Lavender Linen’ & is the perfect place to cosy up with a cup of tea & a good book. 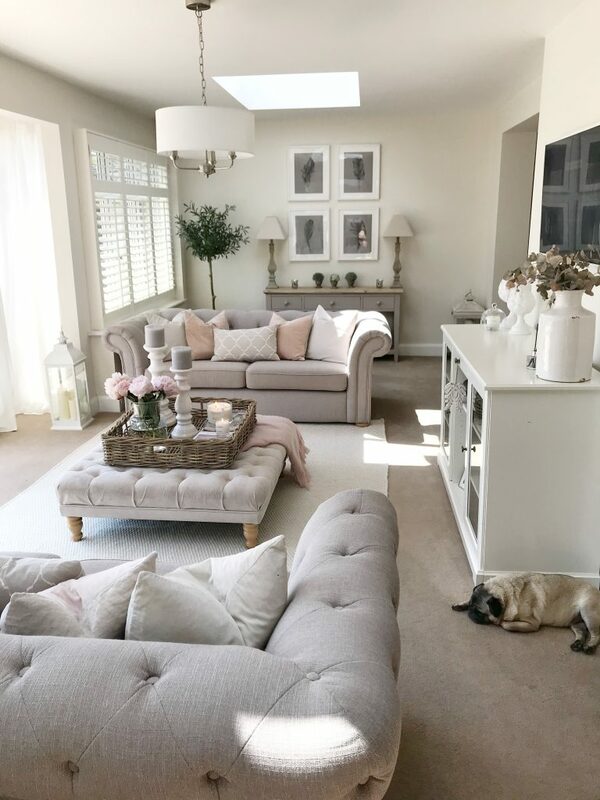 The sheepskin throw over the back is actually a rug which was from Homsense (although I know Ikea sell them very reasonably) & the cushion is the same blush from Christy we have on the sofa’s to tie them in. 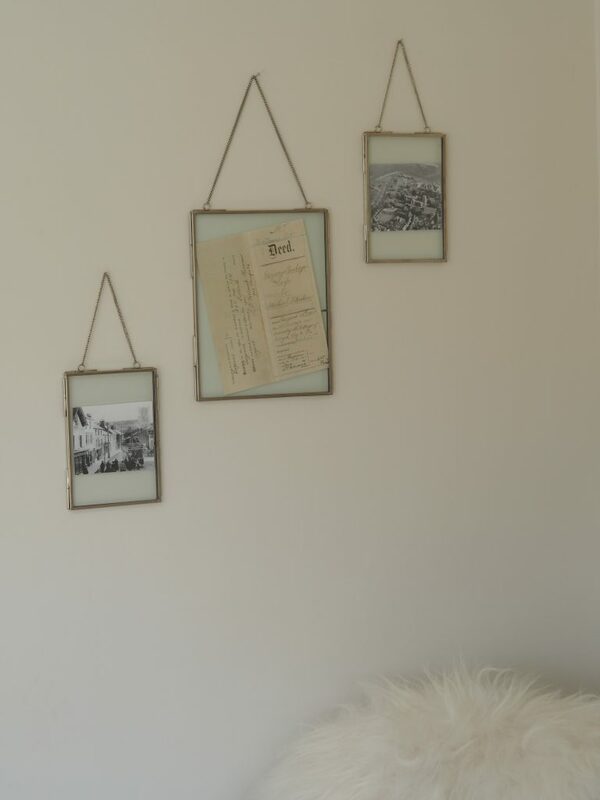 I’ve hung these gorgeous hanging frames from M&S over with some old photo’s of Christchurch & original deeds to bring a bit of history into an otherwise new part of this Victorian house. 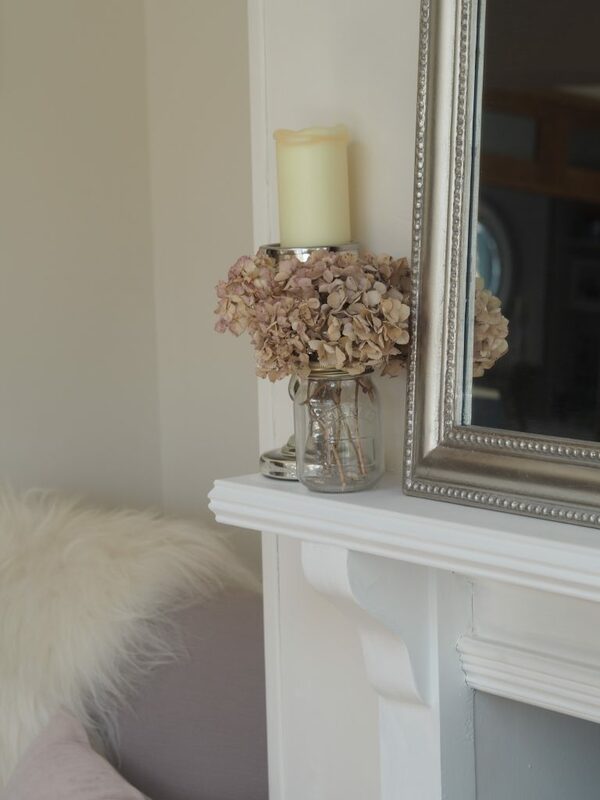 The mirror above the mantel is the ‘Worthington’ from Wayfair in silver (101 x 76cm) & the mercury candle sticks were from The White Company at Christmas time but I just couldn’t bare to put them away! I’ve also popped some dried hydrangeas from the garden in a little mason jar & a photo of my lovely Nan in a frame to watch over us in the busiest room of the house. To the right is the matching floor lamp to the ceiling light, the Grantham in satin nickel from Wayfair. I also have yet more interior magazines in this wicker holder too. 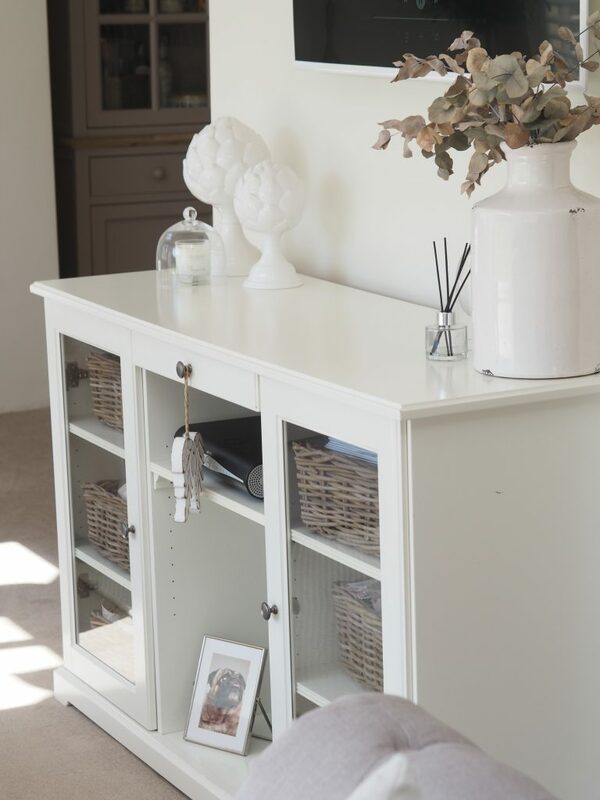 Moving down to the other ‘end’ of the room is my console table (in colour ‘Truffle’) with statement feather prints which you can find on Etsy here. They are in Ikea ‘Ribba’ white 40x50cm frames. The table has two lamps which were from The Range originally, these gorgeous little artificial hedge urns from Hudson Home. 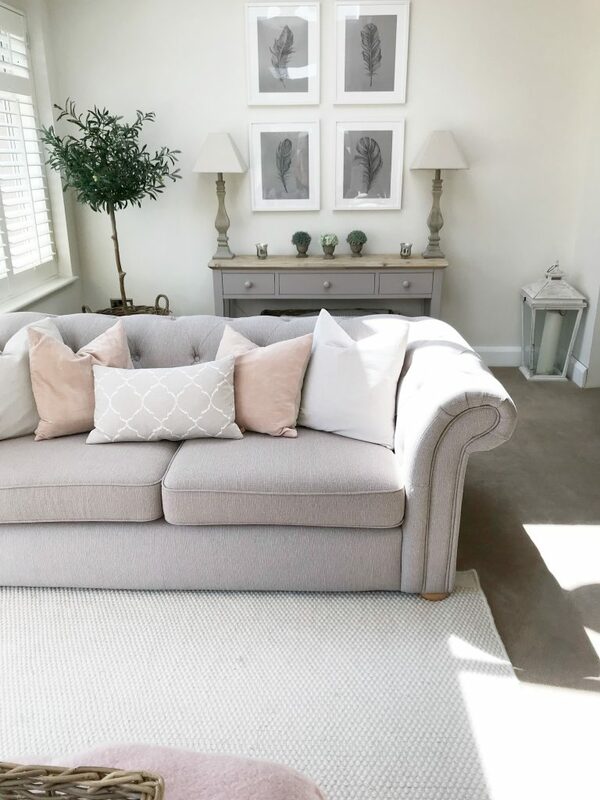 Below is the large Somerton basket from Neptune with my favourite pom pom chunky knit throw from M&S in it then two silver easel frames here. To bring a bit of greenery in here I popped this artificial (because I seriously kill every plant that comes in to this house…) olive tree from Neptune in a round wicker log basket. It brings life to the space without being too ‘in your face’ & still keeps within my neutral scheme. I hope you’ve enjoyed this weeks Home Tour Friday! It’s certainly one of my favourite rooms & especially this week in the gorgeous weather we’ve had it’s definitely looking even more spectacular with the doors wide open & sun shining through. 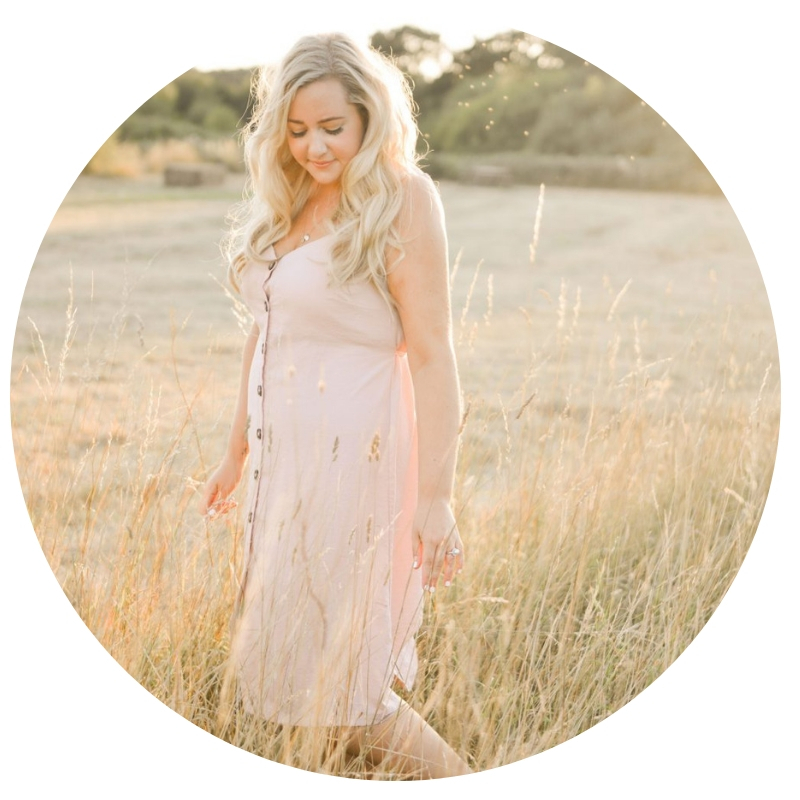 I loved reading about (and seeing pics of!) your living room. 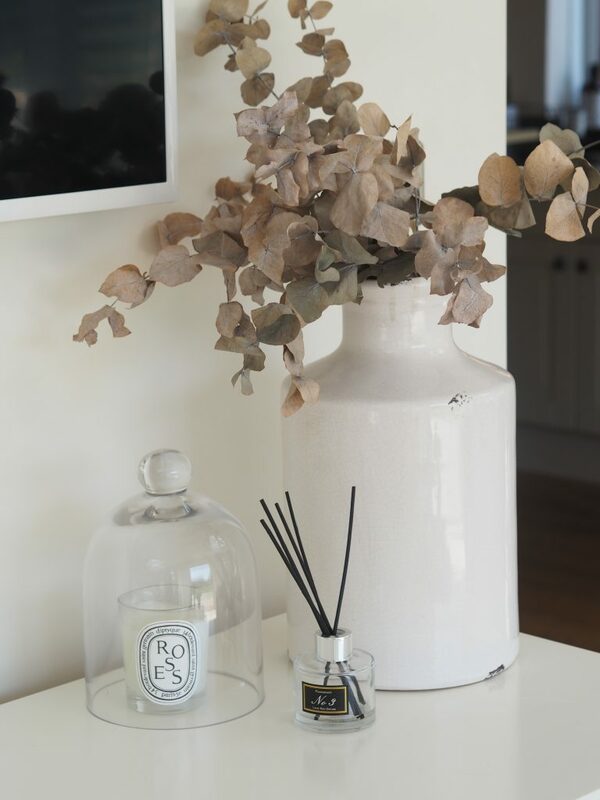 I love the balance you’ve got between luxurious but at the same time, homely and serene! I’m actually considering having a conservatory put in, so it was good to hear about your experiences with one. 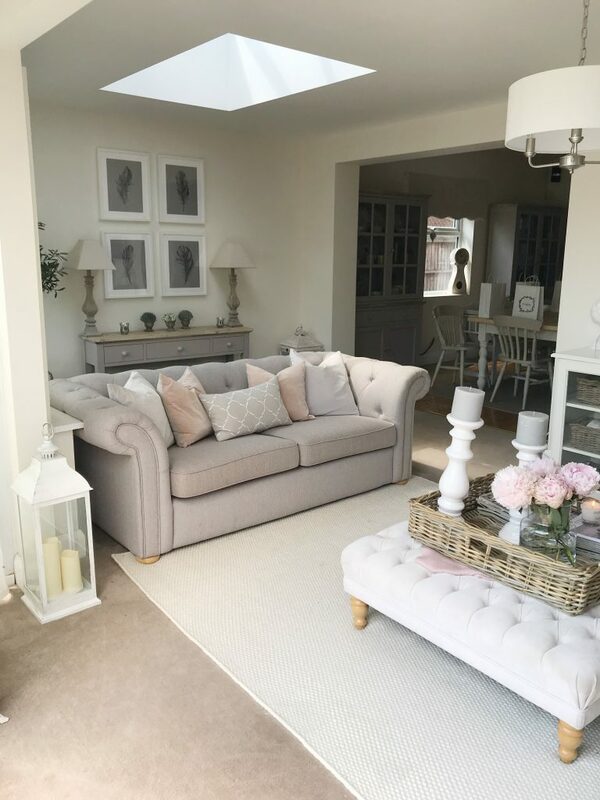 I have found your conservatory makeover posts and am reading through those now for inspiration! 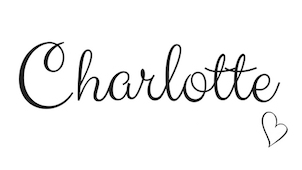 Hi Charlotte love your look. Where did you get your console table please?